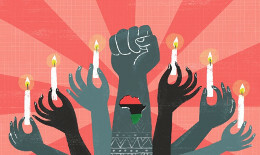 In Syria, the uprising against the oppressive regime of Bashir-al-Assad has continued for almost a year. Thousands have been killed, many have lost their homes, livelihoods and loved ones. In the recent weeks the violent and murderous attacks by the Assad regime have escalated and the international community is failing to respond to the oppression and humanitarian crisis. We, Occupy London, condemn the violence against Syrian people and support their uprising for freedom. Throughout the winter, Occupy London has engaged with the Syrian community in London. We have organised events to discuss the Syrian situation and show solidarity: This has included talks about human rights as well as live video links to the Syrian protests in November and December and a General Assembly in front of the Syrian embassy on Friday, the 10th February. As part of a worldwide movement for equality and democracy Occupy London stands in solidarity with all struggles for freedom and justice. In a globalised world where the interests of elites, dictators and corporate powers are deeply intertwined, no uprising is isolated and resistance needs to be built beyond borders. This is why our thoughts are with our sisters and brothers in Syria, to whom we want to say: Your fight is our fight. Let’s start to build together The Global Square at Berlin Biennale! #Bahrain: Shouting in the dark. The silenced revolution.